with the bold text in the example below: The Skychi Travel Guide : Celebrity Apprentice Showcases South Africa: Are You My Zulu Dancing Man? Celebrity Apprentice Showcases South Africa: Are You My Zulu Dancing Man? 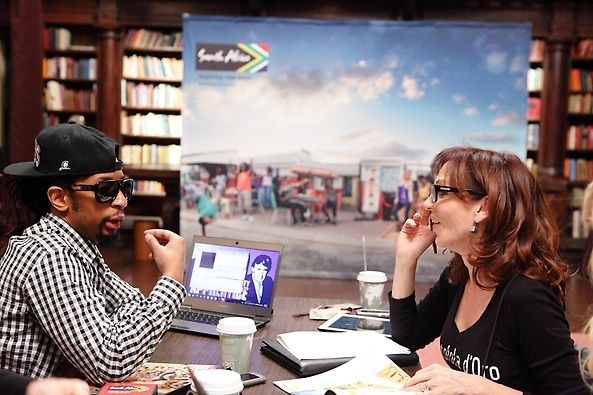 Celebrity Apprentice selected South Africa Tourism to judge a travel experience expo about "The Top 5" experiences of South Africa. The teams had a choice between Romance or Adventure experience. Lil Jon of Team Power choose the Adventure experience because he believed a safari would be the adventure experience. He was surprised to learn that safari was not on the list. Instead the adventure experience included glamping, surfing, golfing, zipling, and cage shark diving. Penn Gillette of Team Plan B showcased South Africa's food, wine, sites and culture with Zulu Dancers. They even added a spa experience to the list. I won't tell you who won the challenge. You have to watch the episode to see what happens. Click here to watch now. My "Top 5" experiences in South Africa are ziplinling, cage shark diving, spa, food and wine. Thanks to this challenge I view South Africa in a different light. What are your "Top 5" experiences to do in South Africa?